I am grateful that my work for the Center for Vitality of the Arkansas Conference allows me to travel the state to work with our amazing congregations. 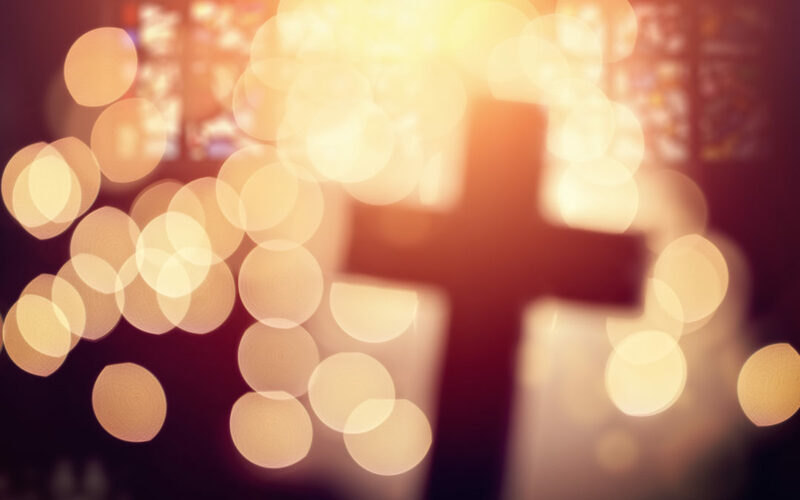 Lately, I have been focused on working with about 20 congregations who are developing intentional discipleship systems (appropriately these churches are referred to as The Twenty). “The Last of the Real Ones” opens with an image of someone feeling all alone and then finding the one around whose life he wants to revolve, even using an image of being the planets revolving around the sun (which in my head also implies Son). This person will follow his newfound companion because this companion is “the last of a dying breed,” confessing that the follower is “here in search of your glory. There’s been a million before me, that ultra kind of love you never walk away from. You’re just the last of the real ones.” Later, the singer proclaims tunnel vision in which all he sees is this “real one,” and then looks toward the “beginning of the end, the end of infinity with you.” Since there is no end to infinity, this moment marks both an end and beginning, which captures that dying/living moment of baptism. This song catches for me that turned around, running-after-Christfor-all-you-are-worth kind of love that real discipleship grows from. I cannot make claims that Fall Out Boy had those intentions in writing this song, but certainly, as I hear it, it speaks to a longing for an authentic, enthusiastic relationship with the one true Christ. Following Jesus is transformative, and creates in us a new life where we can more fully live as the people we are created to be. But we do a disservice to ourselves and to those who are just learning to follow Christ if we make it seem like the journey is always an easy one. Even if we never waiver in our faith in Christ (which I expect most of us do at some point in life), we all face tests of our faith. Some of us are made to feel foolish for following Christ. Some of us will lose people in our lives because we choose to follow him. There are losses in the midst of great gain, and those losses are painful. 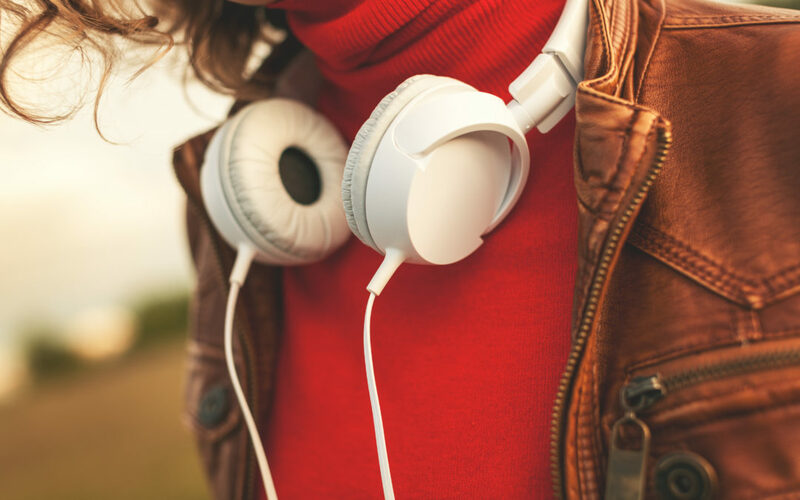 These two songs together remind me of my journey, and they help me stay focused on the work I have before me to help others grow in their relationship with Christ. They remind me of the joys and the struggles and keep me grounded in the reality before me even as they help me imagine the reign to come. What connects you to your journey as a disciple? Share with me at michelle.morris@arumc.org. Perhaps you have noticed it as you drove through Hot Springs down Central Avenue. 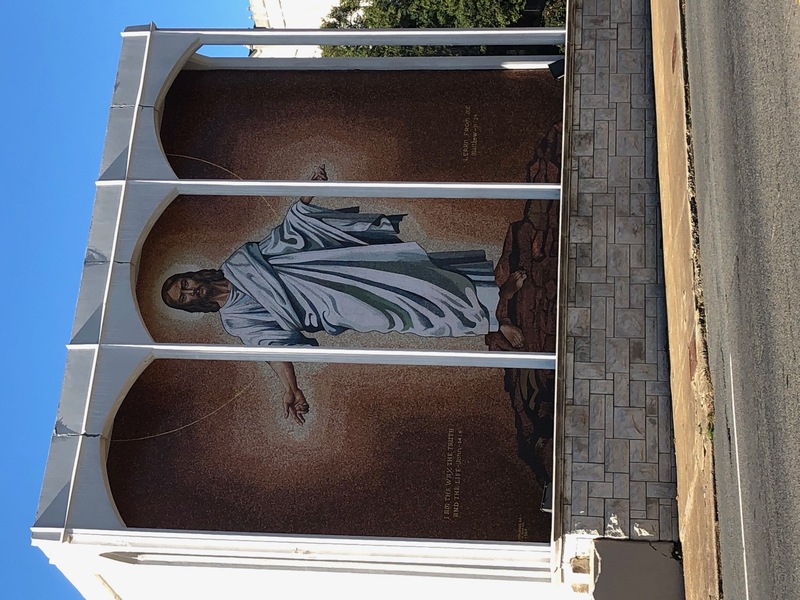 On the street side of First Hot Springs is an 18 foot 9 inch tall Jesus, beautifully portrayed in a mosaic of 488,000 Italian glass tiles, his arms outstretched as he welcomes all to come to him. The restoration began this fall. 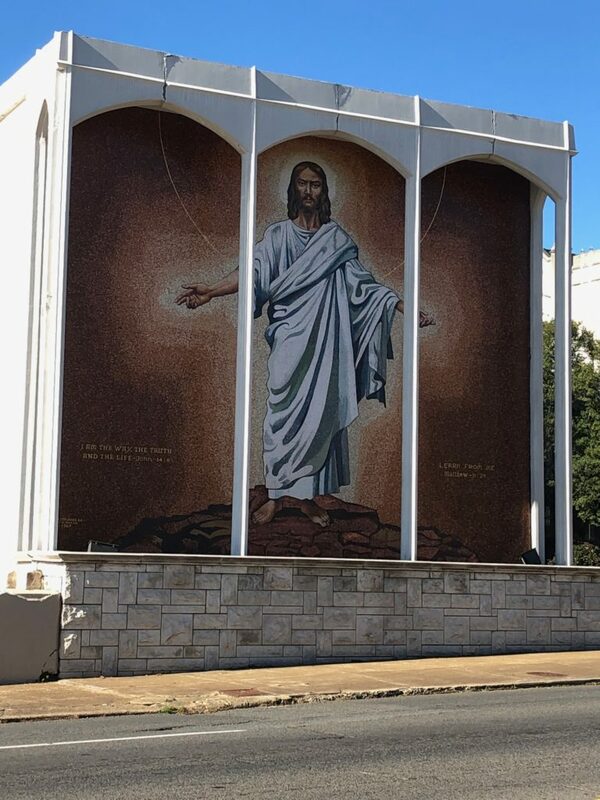 What had initially cost $374.97 when it was installed in 1965, the mosaic Jesus now totaled around $80,000 to repair. Wendell Norton and his firm, who handled the restoration, were able to use some excess tiles that had been stored in the church since the 1965 installation to help with the work. In December, First UMC celebrated its completion in a service that included city personnel as well. The next time you find yourself in downtown Hot Springs, keep your eyes and heart open to being welcomed by this beautiful body of Christ. In just a few sentences in his introduction, Hendrix Associate Professor and Mercy Community Church of Little Rock founder, Dr. Robert Williamson captures the aim of his book: “I hope that reading this book may open up a little-known part of the Bible to you in new and unexpected ways. These forgotten books have a lot to say. I don’t expect you will agree with everything they (or I) have to say, but I do hope they may provoke you to think and act in more theologically rich ways – as they have done for me” (xix). About halfway through his book, I realized how true that statement was. Each of the biblical books he examines are contrary voices to some dominant perspectives of Scripture. Then Williamson himself applies the texts to amplify voices in our current context that at times struggle to be heard. Williamson studies the Five Scrolls, the Jewish name for the books of Song of Songs, Ruth, Lamentations, Ecclesiastes, and Esther. He points out that while each of these books have come to take a precious place in Jewish faith, as readings from these books are all tied to significant moments in the Jewish year, they are frequently ignored in Christian circles. Perhaps the reason for sidelining these texts is that they present somewhat challenging theological perspectives. 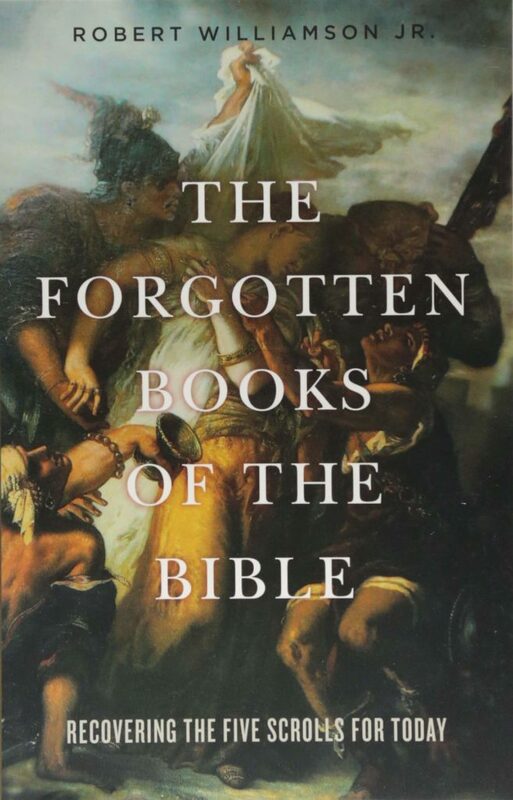 In fact, Williamson shows through his careful study how these works challenge the voices of other biblical texts. Song of Songs, with its joyful celebration of sexual expression, stands in contrast to the restrictive passages of Leviticus and some of Paul’s letters. Ruth is a bold answer to Ezra-Nehemiah’s call to cast out the foreign wives and children, as Ruth is a Moabite woman who not only integrates into Judah but becomes the great-grandmother of King David. Ecclesiastes presents a voice with little to no hope in an afterlife and a theology that God can be unreliable, which stands in notable contrast to much of the New Testament. Esther tells a Jewish story from a position of oppression which, while many of the biblical texts are written from similar perspectives, are not necessarily the voices we most like to hear. At the center of the book, though, Williamson’s discussion about Lamentations may capture the heart of his project, and may also serve a great need in the church, and our society, today. Williamson points out that there are five voices in conversation in Lamentations: the Funeral Singer, Daughter Zion, the Strong Man, the Scoffer, and the Community Voice. Williamson takes time to distinguish the unique social and theological perspectives of each voice. In the end, however, the Community Voice finds ways to hold all of them together. That final voice recognizes that there is wide diversity in how we respond to situations, notably traumatic situations, and that all of those voices have their validity. They should all be heard, and they should all hold together to make a complete whole. This word is one we desperately need in our church today as we struggle to find unity amidst diversity. This book might serve as a way to begin such “holding together” work. In his application of the biblical texts to current issues, Williamson deals with the #metoo movement (Song of Songs), immigration (Ruth), Black Lives Matter (Lamentations), Terror Management Theory (Ecclesiastes), and the rise in white nationalism (Esther). Because these issues can be very divisive ones, there is a distinct possibility that this book could exacerbate some division among us. However, because this book is structured as an invitation to see these biblical books as additional voices in the conversation, perhaps Williamson’s work could inspire frank conversation that is respectful and loving. After all, if the Bible can canonize diversity of thought and ways of living, can we not also model such a community? Surely there is hope amidst lamentation. Should this book prove too controversial to attempt as a study, I do think it would serve as a welcome resource on the Five Scrolls for pastors and seasoned teachers of the Bible. Williamson’s exegesis is careful and also accessible. Though he works often with the Hebrew, he does so in a way that is not intimidating but rather inviting. His headings in the chapters could allow someone who chooses to do a sermon series on the scrolls quick reference to notable points about the works and their contexts. You may not agree with everything Williamson says in this book, but do not seek agreement in reading it. Instead, seek a space for rich conversation, for in such spaces relationships grow. This potential for growth in knowledge of the Bible and each other is the central usefulness of Williamson’s work.